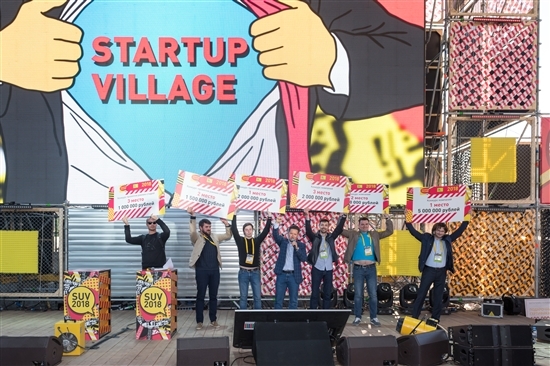 The sixth Skolkovo Startup Village ended on Friday evening with an awards ceremony for the winning tech startups and projects that had taken part in the event’s competition. The winners of the 2018 Startup Village hold up their prizes on the main stage for a group photo. Photo: Sk.ru. The winning companies were awarded with certificates for sums of money that they can use to develop their projects and companies once they get expert approval to become a Skolkovo resident, if they are not already residents. The Startup Village features two competitions: a companies category for tech startups that are already formally established and already operating, and an ideas category for early-stage companies. Sergei Karamzin of Trombodynamica won the top prize. Photo: Sk.ru. 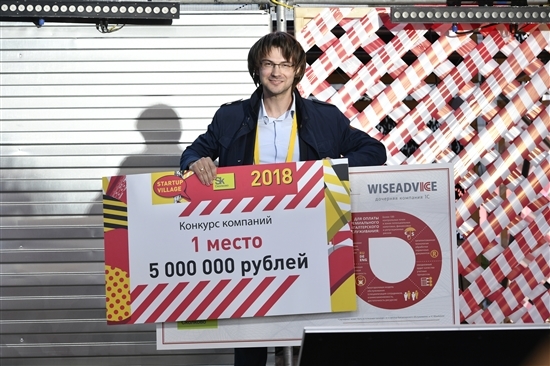 The first place of 5 million rubles ($80,000) in the companies category was won by Sergei Karamzin of Trombodynamica (Hemacore), which has developed tests to help doctors to prevent thrombosis in patients. The company already operates both in Russia and on Western markets, and has seen revenue of almost $1 million dollars, Karamzin said upon accepting the award. “I know the project is complicated, like any medical project, and revenues at that level are an excellent result,” said Kirill Kaem, the Skolkovo Foundation’s senior vice president for innovations, who presented the awards. The second prize of 3 million rubles went to Robot Vera, a cloud-based robot who helps companies to fill vacancies. Robot Vera can call candidates to discuss job vacancies with them, answer their questions and conduct preliminary interviews. The third prize of 2 million rubles went to ParkWise, a smart parking platform that informs users of street parking availability. In the ideas section of the competition for early-stage companies, the first prize of 2 million rubles went to chatme.ai, a smart assistant that uses artificial intelligence. The second prize of 1.5 million rubles was awarded to TheBestCeller, which is working on breakthrough cell technology that should in the future help child cancer patients. The third prize of 1 million rubles was given to FDM 2.0, a 3D printer. Other startups were awarded prizes by some of the Startup Village’s sponsors, and the winners of the main categories were also awarded with additional prizes, including accountancy services.